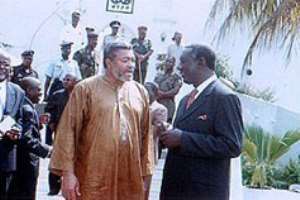 Ghana's former President, Jerry John Rawlings says the incumbent President John Agyekum Kufuor is a disgrace to Ghana. “He Kufuor is a disgrace to Nkrumah's Ghana, his own Ashanti brothers and sisters have lost absolute faith in him, the international community especially those within the West African sub-region are concerned about the divide and rule tactics of President Kufuor and his NPP cronies. The controversial former president was speaking on Peace FM's popular morning show programme 'Kokrokoo'. He said Kufuor's government is corrupt and incompetent and they came to power by lying and misleading Ghanaians and wants to remain in power to cover up for their misdeeds. He repeated the claim by some NDC executives that the NPP government sponsored the killing of Ya-Naa Yakubu Andani, the paramount chief of Dagbon Traditional area. Former President Rawlings said human rights abuse under this government is unimaginable. He said because President Kufuor and his NPP cronies cannot preside over a united country, that is why they were adopting every means to divide the country. Jerry Rawlings asked Ghanaians to end the term of NPP in the December election. Blame The Damaged National Psyche On Journalist The former President, Flt. Lt. Jerry John Rawlings has blamed the polarized national psyche with regards to the truth on the part of some journalists. He noted that instead of journalists using their role to bring about civility between members of the public, it has rather been the exact opposite. The former President expressed these sentiments in an exclusive interview with Kwame Safa Kayi during the “Kokrokoo” programme, on Tuesday. According to him, so much damage was done by journalists during his tenure of office, yet he “let it ride”. The former President also disclosed that though he harbours no hard-feelings against anybody, he is not happy at the level on injustice pervading in the country. “I'm not a bitter man… but as long as injustice prevails, I'm not a happy man either, period,” he added.